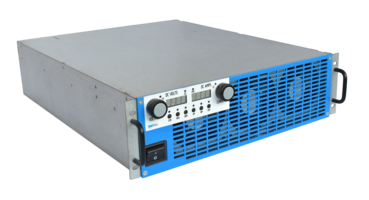 Bel Power’s TSR10 is a 10 kW, DC programmable laboratory power supply. Product is a 3U, 19” rack mounted precision power unit that can operate on loads from short- to open-circuit and constant voltage/constant current auto crossover. The unit features a 3-phase input voltage of 360 - 440 VAC power supply. It offers an adjustable DC output voltage between 0.5 V and 50 V, and output current between 0.5 A and 200 A.
Santa Clara, CA [September 11, 2018] Bel Power Solutions and Protection, a Bel group company (NASDAQ: BELFA and BELFB) and premier global manufacturer of power management devices, announces the TSR10, a robust, high power 10 kW, DC programmable laboratory power supply. The TSR10 is a 3U, 19” rack mounted precision power supply which delivers clean and stable DC power, with operation allowed on any load from short- to open-circuit and constant voltage / constant current auto crossover. Easy to use, the TSR10 is ideal for testing in laboratories and for general industrial purposes, including research, component device testing, automated systems, aerospace and satellite testing. The TSR10 has a 3-phase input voltage of 360 - 440 VAC power supply with adjustable DC output voltage between 0.5 V and 50 V, and output current between 0.5 A and 200 A. The front panel display contains settings for monitoring output voltage and current, including adjustable overvoltage, adjustable overcurrent, short circuit and feedback voltage proof, overtemperature (OTP), safe/auto start, front panel lock and phase loss detection. TSR10 communications include the CAN Interface and analog programming/monitoring (0-5 V or 0-10 V user-selectable), auto restart after power cut, mains, output voltage and current indication, front panel lock (selectable from the front panel) and/or from the software, independent remote ON/OFF and remote enable/disable, continuous encoders for voltage and current adjustment (coarse and fine mode), last setting memory and remote reset. The TSR10 is currently in stock with Mouser. For more detailed information, visit the TSR10 product page here or download the datasheet. For technical inquiries, send an eMail to Tech.Support@psbel.com, call +1 866-513-2839 for North America and +49 6172 95520 for EMEA or visit belfuse.com/power-solutions. Bel (www.belfuse.com) designs, manufactures and markets a broad array of products that power, protect and connect electronic circuits. These products are primarily used in the networking, telecommunications, computing, military and aerospace, transportation and broadcasting industries. Bel’s product groups include Magnetic Solutions (integrated connector modules, power transformers, power inductors and discrete components), Power Solutions and Protection (front-end, boardmount and industrial power products, module products and circuit protection) and Connectivity Solutions (expanded beam fiber optic, copper-based, RF and RJ connectors and cable assemblies). The Company operates facilities around the world.